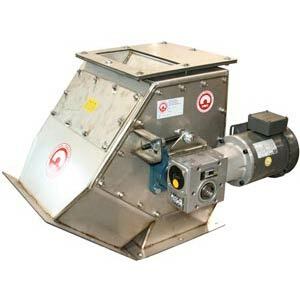 IMI’s Magnetic Drum Separators provide ferrous metal removal from dry, bulk products in free-flowing processing systems and by nature of design are continously self-cleaning units. Material to be processed enters the top of the housing and flows across the surface of the drum. As the drum shell rotates around the stationary, 180 degree magnetic field, all non-ferrous product, which is unaffected by the magnet, falls free from the drum into the cleaned material flow. Any ferrous tramp metal is captured by the magnetic field and is held on the drum’s surface. As the drum rotates, the ferrous metal is carried past a diverter and released outside of the magnetic field. IMI specializes in custom Magnetic Drum Separator designs to meet customers’ specific requirements (as shown) and offers numerous options such as; custom inlets & discharge transitions, Stainless Steel drum shafts, multiple drum assemblies, fine particle discharge and abrasion resistant facing.